52 Ancestors, No. 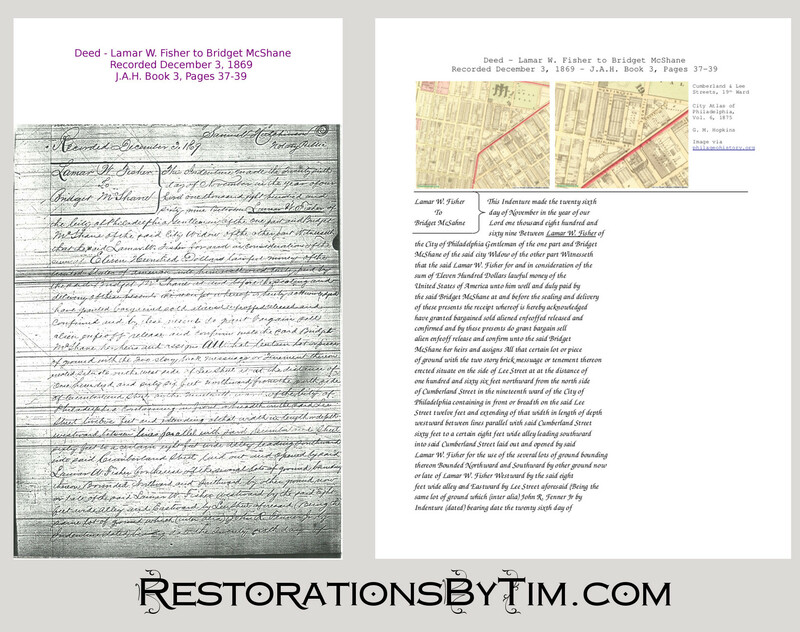 15: Bridget McShane, Irish Woman of Property | Photo Restorations by Tim G.
This week I offer the third installment of my McShane series, as I am still compiling McShane family documents for my great aunt and uncle, in between other tasks. There may be another installment next week, depending on whether I can wrap up the project this week. Today’s subject is Bridget McShane, the matriarch of my branch of the McShane family in America. Among her children were my third great-grandfather, Patrick McShane, and Villanova University President Fr. Francis J. McShane, O. S. A.
I don’t know too much about Bridget’s daily life. Her distinguishing characteristic, the historical record shows, is that she was the title owner of two properties in Philadelphia, each purchased at eleven hundred dollars, during the time she was a widow. These purchases occurred in 1856 and in 1869, well before Fr. Francis J. McShane rose to prominence as a University Professor, so I can’t really fall back on that as an explanation for her means. Using an online inflation calculator, these purchases would have amounted to about $30,500 and about $19,000 respectively. Although these were modest properties, my sense is that Bridget was better off, financially, than many of her immigrant peers. She was born Bridget McNichol in about 1811, according to the age on her death certificate. I do not know exactly where in Ireland she was born, but by the mid 1830s, she had married Terence McShane and had several children in Aughnacloy, County Tyrone. They had at least seven children by 1846. The family began its migration to America in the late 1840s. I know that her son, Patrick, my third great-grandfather, came to America in about 1848, and that Bridget’s youngest son, the future Fr. Francis J. McShane, came to America in 1855. I’m not yet sure exactly when or with whom Bridget came to America, but it was certainly prior to 1856, when she purchased her first property in Philadelphia. The McShane family lot, Old Cathedral Cemetery, West Philadelphia. Photo by Tim G.
The McShane family emigration occurred during the height of the Great Famine years of 1845 through 1852. In addition to this ubiquitous hardship, Bridget’s husband, Terence, must have died sometime prior to 1856, when Bridget was identified as a widow on the deed to the first property she bought in America. I do not know whether Terence died in Ireland, before the family’s emigration, or in America afterwards. However, I recently came across a ship’s passenger list on Ancestry.com that purports to show a Terreance McShane emigrating to America in 1846, with three children, Owen, Peter, and Mary. I am in the process of confirming whether these are my ancestors. I know there is a Peter and a Mary in the family. I am not yet acquainted with any Owens. In any case, land records show that Bridget purchased her first property from one Joseph Keeley on March 11, 1856 for $1,100. This property was near the corner of 13th & Stiles Sts., in Philadelphia. She purchased her second property from one Lamar W. Fisher on November 26, 1869, also for $1,100. This property was near Lee and Cumberland Sts., also in Philadelphia. I do not yet know what relationship, if any, that Bridget shared with Messrs. Keeley and Fisher, but they might be worth investigating. Bridget’s son, my third-great-grandfather, Patrick McShane, purchased the Lee St. property from his mother on September 25, 1873 for full consideration, again of $1,100. (Am I to believe these prices are all the same by coincidence?) Bridget devised her Stiles St. property to her daughter and son-in-law, Bridget and Patrick McGeehan. The transfer occurred upon Bridget McShane’s death on November 2, 1881. 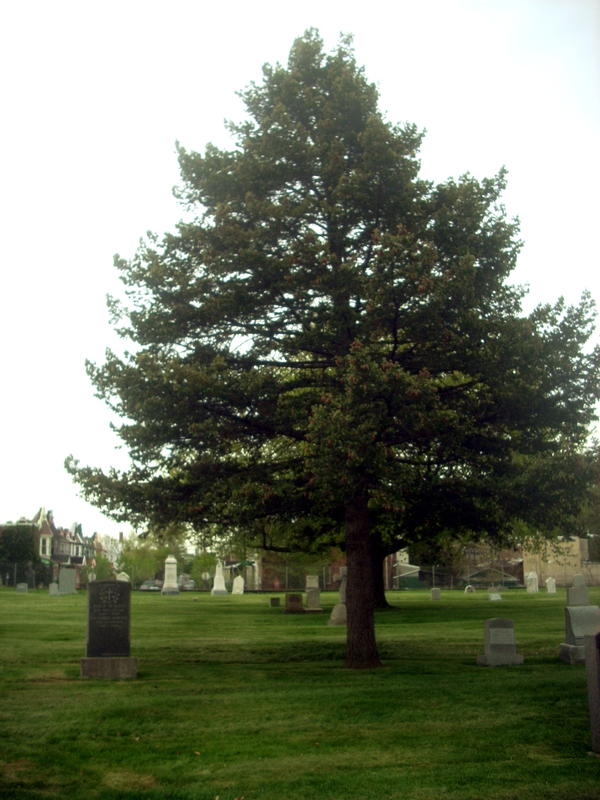 Bridget was buried in the McShane family’s unmarked lot in Old Cathedral Cemetery at 48th St. & Lancaster Ave., in West Philadelphia. Bridget’s featured image is that of the first page of the 1869 deed of sale of the Lee St. property from Lamar W. Fisher to Bridget McShane. On the left is the worn microfilm copy of the deed. I asked to see the original recordings of these documents, but the archive apparently disposed the original recordings after about 1860 long ago, keeping only the microfilm copies. The archive did have the original deed recording from Bridget’s 1856 purchase from Joseph Keeley. I photographed that document. The other deeds recordings have been relegated to worn and faded microfilm. It the case of the 1873 deed of sale from Bridget to Patrick, even the microfilm had gone missing. Fortunately, the archivist was able to pull up a digitized version of that reel from his computer database, but the quality of that scan was sub-par, even for microfilm. I would like to think that perhaps the Pennsylvania Historical Society or some other interested party has taken possession of the original recording books, so I can see these documents in their original clarity, but I don’t yet know what became of them. I have tried my best to make true, line-by-line transcriptions of these deeds. Where possible, I have included snapshots of contemporary maps of the described areas. The web site of the Greater Philadelphia GeoHistory Network provides an amazing map resource for the Philadelphia area that includes scans of historic maps from the collections of the Free Library of Philadelphia and The Athenaeum of Philadelphia, among others. Users of the GeoHistory site may even lay a current Google Map over the historic maps to note any changes. For example, in present-day Philadelphia, Stiles Street ends at 12th Street. It does not continue through to 13th street, where Bridget McShane’s property was once situate. Finding one’s ancestors’ properties on a historic map, once given a description of the location on a deed, may be tricky if the names of the streets have changed since then. Philadelphia street names have undergone at least two major upheavals, once in the 1850s, and again in the 1890s. Fortunately, PhillyHistory.org offers an online resource for looking up street name changes. Philadelphia family historians may combine this resource with the The Greater Philadelphia GeoHistory Network’s superb website to pinpoint any ancestor’s 19th century Philadelphia property on a map. I found Bridget McShane. Can you find your ancestors? ← 52 Ancestors, No. 14: Patrick McShane, Irishman. Boatman. Milkman. Watchman.